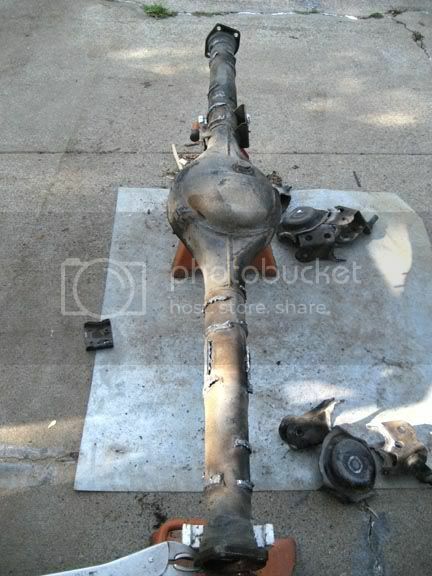 MA46/MA47 Celica-Supra rear axle into AE86 swap. Write up & a lot of other related information. Before I start I just wanted to give a massive THANK YOU to Jon (Jonnie Fraz of http://www.stealth-custom-fab.com) for all his help & hardwork on the axle housing. FYI: there are several ways to do this swap. This just happens to be the way I wanted it done. 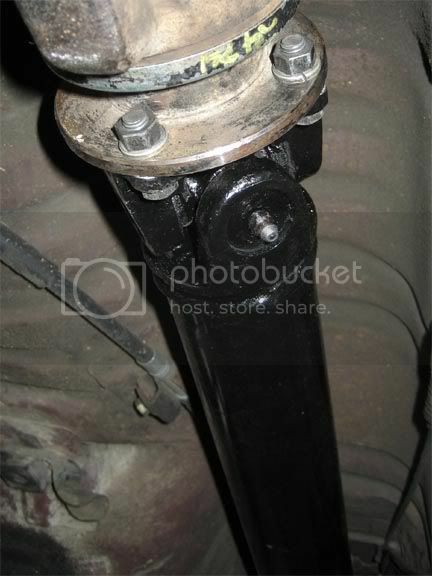 You can do it with much less work by using a longer panhard & also different control arms &/or bushings/heims with the larger 14mm ID to match the celica-supra rear end bolt size. For instance T3 makes a ‘bolt-in’ 4-link & Lateral bar kit, it would mean you would only have to swap spring seats. 1. The axle housings I’ll be using, two will have the mounts removed to make into one (SR5 & MA46) and one extra to build/verify the jig with (GTS). 2. 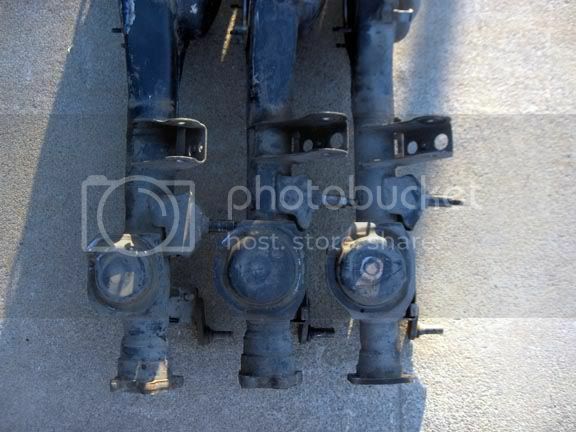 Here you can see how close in length the axle housings are. The MA46/MA47 is only a total of 15mm longer than both AE86 ones (which are the same length). 3. 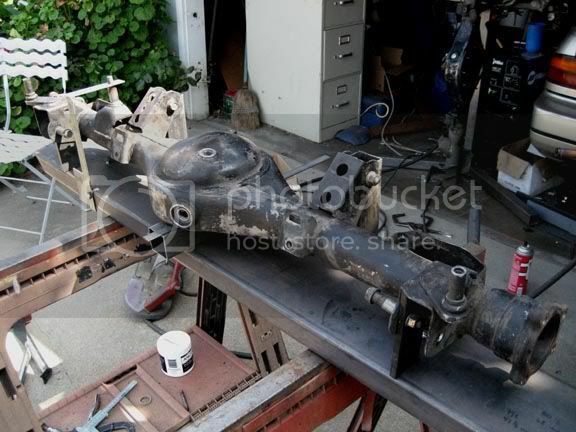 In this pic you can see the spring seats are different sizes, the lateral bar/panhard mount is positioned differently. Whats harder to tell in the picture is that the upper mounts are spread about 1-2″ wider apart on the MA46/MA47 axle housing compared to the AE86. 4. Here’s a side view of the SR5 & MA46/MA47 lower mounts. As you can see they are fairly similar, but the bolt holes & openings are different sizes. 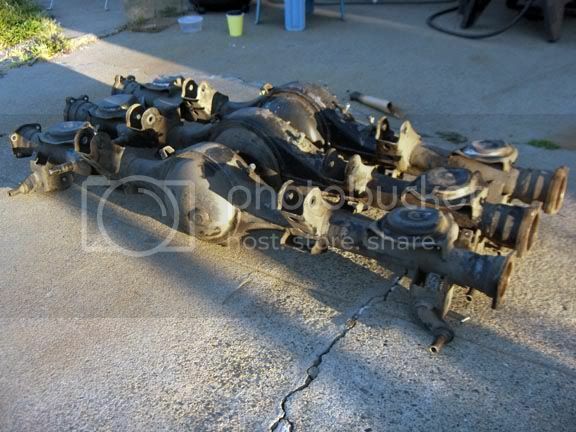 I’ll be swapping all 4 upper & lower mounts from the AE86 axle housing to the MA46/MA47. 5. Building the jig off of the GT-S axle housing. 6. Marshmellows anyone? 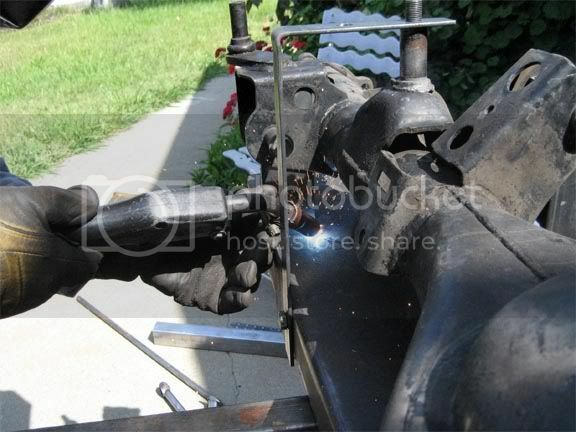 Ready to cut off the AE86 SR-5 housing mounts as well as the MA46 mounts. 7. 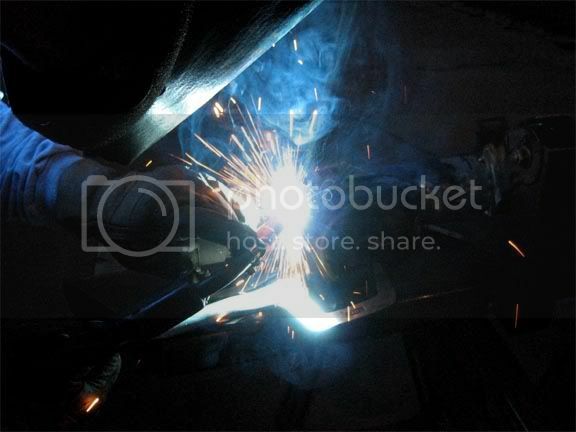 Cutting off the mounts from the AE86 SR-5 housing. 8. 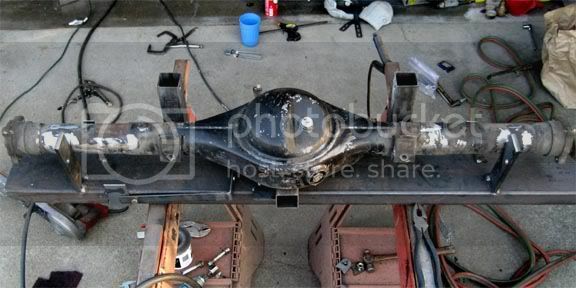 Stripped AE86 SR-5 housing. You can see the spring seats and mounts to be used on the MA46/MA47 axle housing laying on the ground to the right of the housing. 9. Cutting off the mounts from the MA46/MA47 housing. 10. The MA46/MA47 housing w/the mounts cut off. 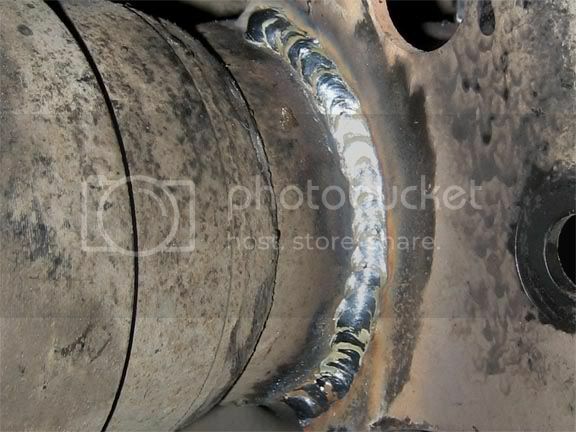 Welds ground flat, and laying in the jig getting ready to tack the AE86 mounts to it. 11. Fitting the mounts and tacking everything on. 12. 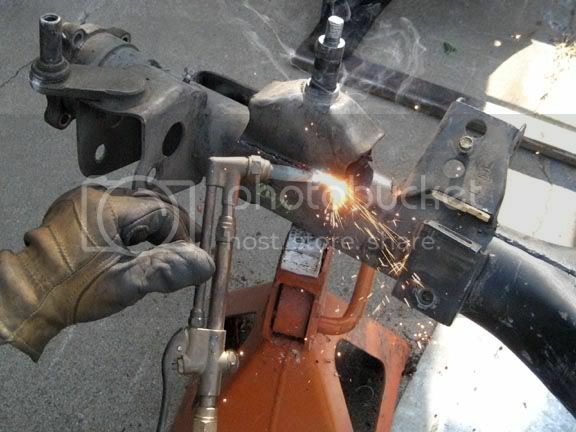 Everything was good so it was time to weld. 14. Housing is done, gave it a fresh coat of paint. 15. Housing mounted in the car, pretty much a perfect fit so far. Used the MA46/MA47 brake hard lines with some minor bending/rerouting at the ends to meet the AE86 backing plates. The AE86 center brake line threads & fits just fine. The Energy Suspension bushings fit perfect for mounting the swaybar (super snug). 16. 3rd member installed, you can see the steel braided brake line for the AE86 threaded into the diff side. Brakes are still capped off until I get the calipers on and get to bleed everything. 17. Axles & AE86 brake backing plates installed. 18. Installed my driveshaft, and exactly as I calculated based on housing/3rd members the driveshaft had be shortened 21mm or 13/16″. 19. Installed my rotors, caliper brackets and calipers. Bled the brake system and adjusted the e-brake. NOTE: The only problem I really ran into doing this whole swap, I found someone had installed different wheel studs than factory, it had some 12 x 1.0mm threaded studs as opposed to the normal 12 x 1.5mm. So I had to take my brakes back off and run to the parts store & get new studs. Installed the new correct thread pitch studs, filled the diff, put my wheels and tires on the car and went for a spin. Runs and drives fine, axle housing is centered like it should be. Good to go (I hope). Miscellaneous other pictures, most related to the swap, and also related to the information found in the post below. Here’s a picture of the MA46/MA47 (black) sway bar bracket & Energy suspension swaybar bracket that came with their bushing kit. You can see the difference in width of the bracket (32.4mm MA46/MA47, & 30mm Energy Susp.). I shaved that extra 2.4mm off with a belt sander and bevelled the edges so it wont cut into the bushing. They fit the swaybar, housing & bracket perfectly. 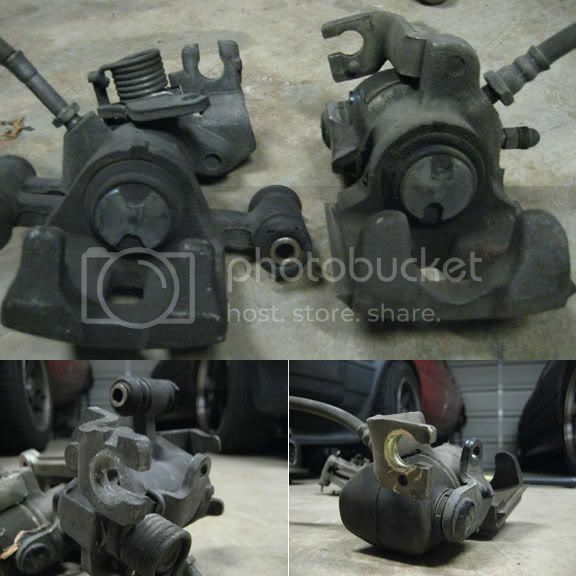 The brake calipers for both the AE86 GT-S & MA46/MA47. The AE86 Park/E-brake cables clip right into the MA46/MA47 calipers with no issues, meaning you can use the MA46/MA47 brakes on the AE86 pretty easily. The backing plates are very similar. The designs of them are slightly different for the 2 different brake caliper brackets. And that the MA46/MA47 backing plate/dust shield is slightly larger for the MA46/MA47 rotors which are 1″ larger in diameter. Brake pads are pretty similar in dimensions, obviously the largest difference is the MA46/MA47 pads are straight across the bottom resulting in a 7mm larger contact patch. But the MA46/MA47 pads are sadly lacking in selection (afaik). Fortunately from how it looks you can use AE86 pads with the MA46/MA47 calipers. 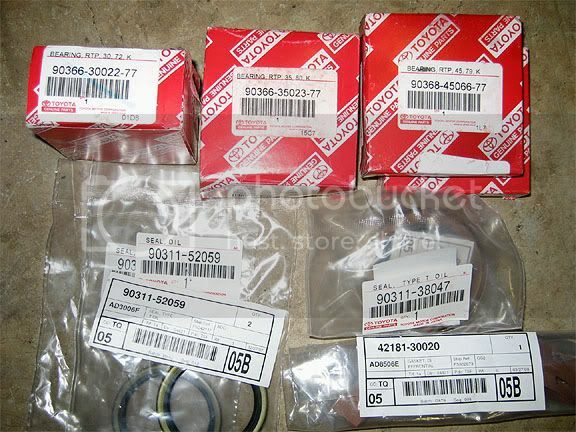 OEM toyota bearings, seals & housing gasket purchased to rebuild differential. Chassis & Differential Codes of the Vehicles I’m using parts from. 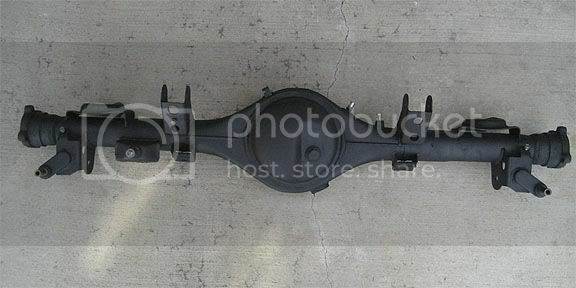 MA46/MA47: F312 – For axle housing, 3rd member, axles. MA67 ____ : F283 – For 4.3 gear set, and possibly LSD options for it. 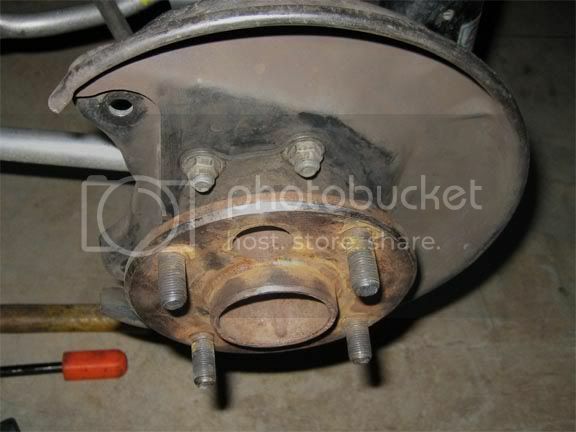 AE86 (GT-S): T282 – For replacement solid pinion spacer (TRD part) & brakes (calipers/mounts/pads). 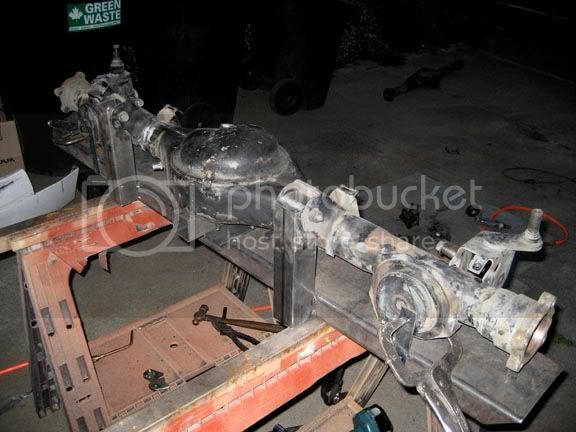 AE86 (SR-5): S074 – For axle housing mounts & spring seats. 1. 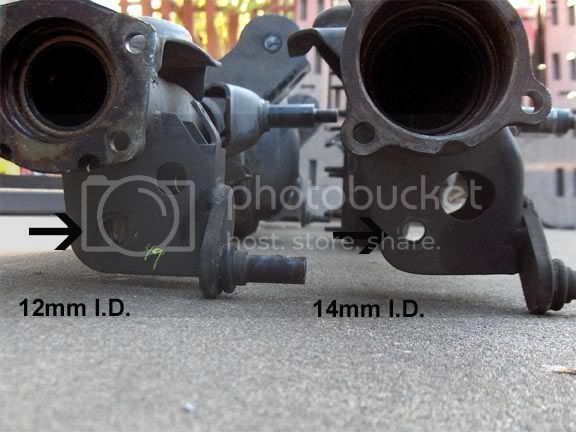 Axle housing ends/Backing plate bolt pattern is the same for both AE86 GT-S & MA46/MA47. 2. Drain/Fill plugs are the same thread/size (interchangeable) as they are for most Toyota’s. So is the differential vent. 3. Pinion Flange same bolt pattern. 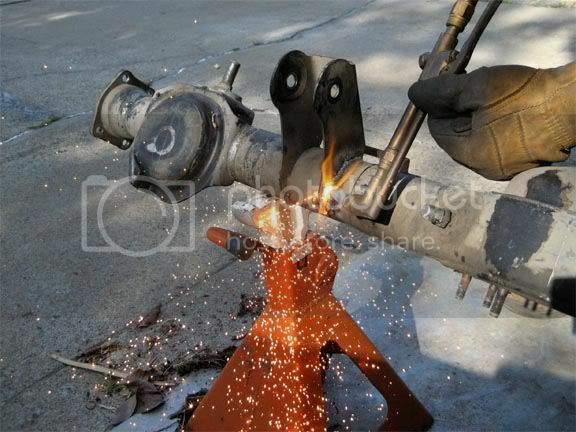 But will require shortening the driveshaft, or a shorter one. 4. Axle housing lengths (actual backing plate flange). 5. 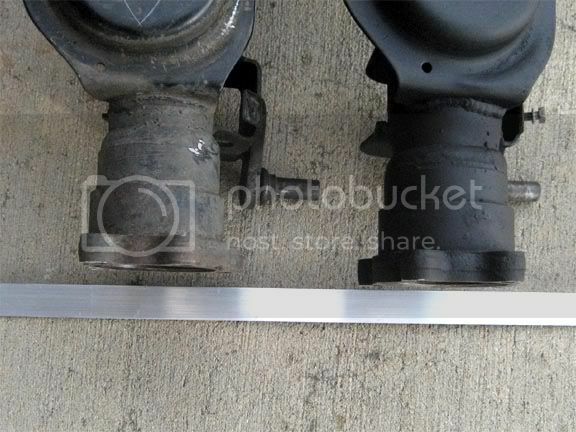 Sway bar mounts on the MA46/MA47 are the same distance apart as the AE86. 6. All other mounts are in slightly different in positions (by angle & placement). AE86 = 24(Zenki) – 25.5mm (Kouki) approx. 7. Wheel bearings & retainers are the same for both MA46/MA47 & AE86 GT-S. 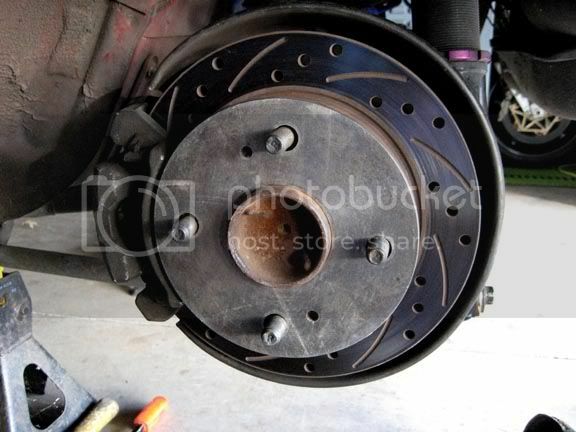 Brake Rotors, Pads, and Calipers Information. 1. 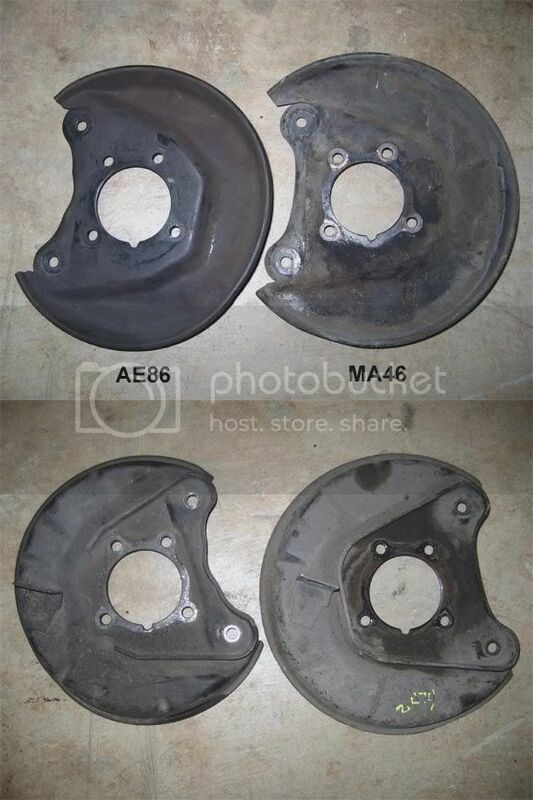 Brake pads from an AE86 can be put on a MA46/MA47. But NOT the other way around. 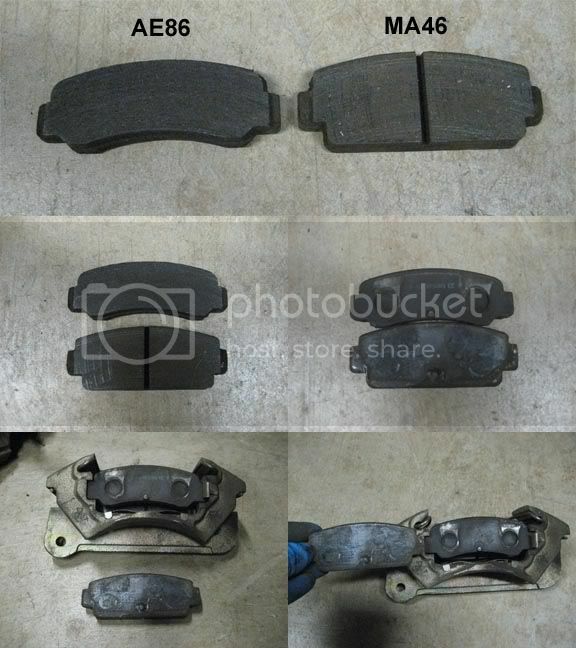 Because the AE86 brake pads are not as ‘Tall’ as the MA46/MA47 brake pads. 9. Calipers, Bracket/Mounts, and Backing plates are different. 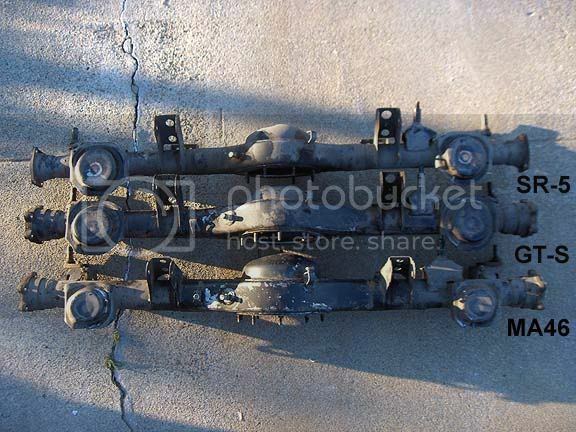 But as a set, are swappable to either axle housing if using all the parts from either the AE86 or MA46/MA47 allowing you to run either MA46/MA47 or AE86 rear brakes on both axle housings. 10. Calipers on both MA46/MA47 & AE86 use the same style Park/E-brake cable attachment. For the US market little or no Celica-Supras had an OEM lsd equipped, where as in Canada most did come with an OEM lsd. There are many more options for LSD available for the MA46/MA47 Celica-Supra than most realize, here’s several I figured out. They ALL require using different carrier bearings with a larger bearing I.D. to fit the carrier (see bearing info below). 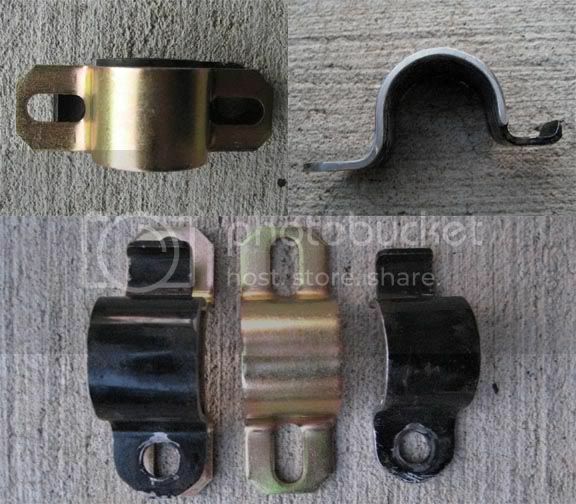 Aftermarket Sway Bar Bushing Information. 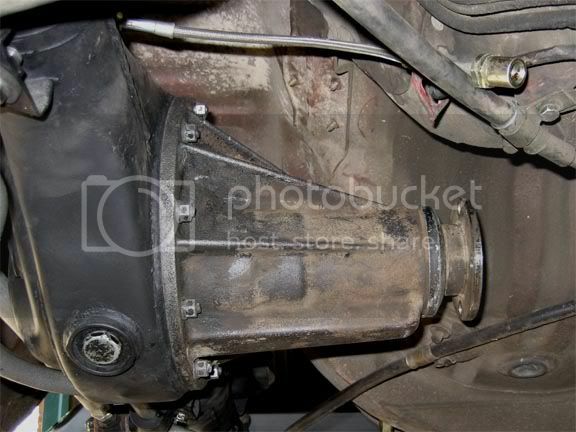 As noted above (See: line 5 under ‘Axle Housing Information’), the sway bar mounts on the Celica-Supra axle are the same distance apart as the AE86 rear axle. 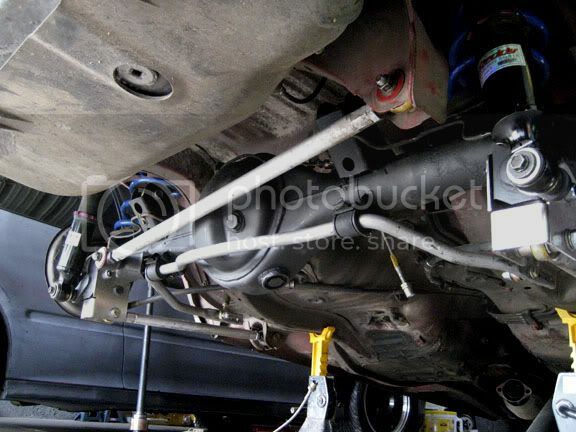 That means you are able to use the AE86 sway bars with the MA46/MA47 sway bar mounts & brackets. 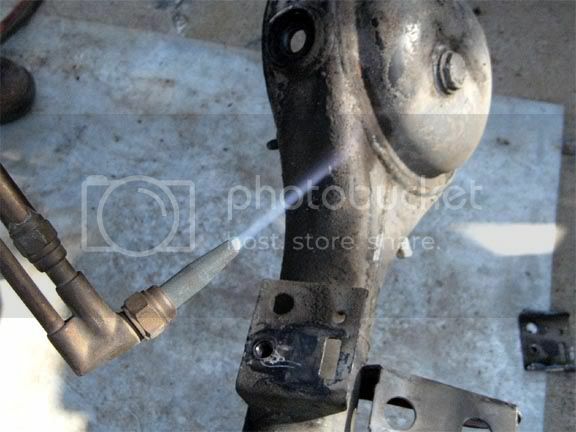 You just need the correctly sized bushings & a minor modifcation to do so. Available Sizes & Part numbers. Axle/Backing Plate Nuts = 44-53 ft lbs. Since the specs are so close, and there is a reason they changed as production went on. I’ll probably just set it up to the newest 2wd Tacoma specs. The only real difference is that there is slightly more preload, but after the bearings wear in that’ll be a non-issue. Toyota Part Numbers – Bearings & Seals. Key: *** means part # is same between MA46/MA47 and AE86. These part #’s below may be necessary to use an LSD in the F-series housing. Tacoma/4-runner part number and information. Part # is from 1st gen Tacoma/2nd & 3rd gen 4-runners. Timken Part Numbers – Bearings & Seals. Timken Replacement part #’s found on www.timken.com in their catalogs. 32010x | Carrier Bearing (No actual listing/part # in the timken catalog.) <– Not 100% confirmed yet! I have measured ID & thickness of bearings on my old 4×4 tacoma front diff carrier (1.969″/50mm I.D. and .787″/20mm Wide). Using those measurements the following bearing should be the right one. At least from what I can tell. Pinion & Carrier Bearing Dimensions only (looked it up for comparison/verification). 32010X | Carrier Bearing Assy w/LSD (Same as ^ MA46/MA47/MA67) <– Not 100% confirmed yet!